"It was the summer after my third year in college, I needed to figure out what I needed to do with my life and career,” said Van Doorn-Kazyak. “That summer there was a movie being filmed in my hometown with Barry Sanders and Kurt Russel." While studying at ComArtSci, Stephanie fell in love with the production process. She loved to be able to create something and see it from start to finish. “To be able to see the finished product and see people's reaction from it makes me feel so good about what I've done, and what I've put together,” said Van Doorn-Kazyak. 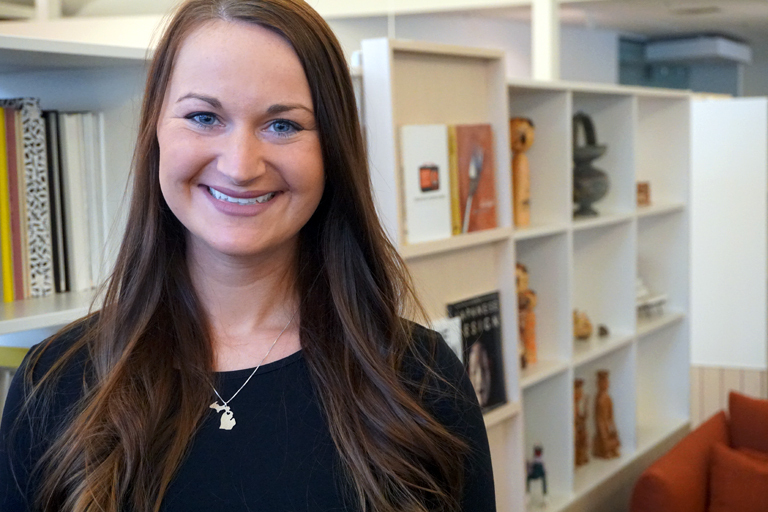 Van Doorn-Kazyak is now putting her communication skills to work at Herman Miller, the iconic modern furniture company. She handles e-commerce interactions, ran a new affiliate marketing program and recently expanded her role to partner with the social media team in representing the Herman Miller brand online. But, Van Doorn-Kazyak is still looking for a challenge. She hopes to shift into content creation, tapping into her passion for production that began years before, on that movie set in her hometown. Although she had a solid foundation from her undergraduate years, Van Doorn-Kazyak decided that a graduate education would give her an edge in her professional goals. Based on her positive experience at MSU, she knew that if she went back to school, it would be as a Spartan. But as a full-time professional located over an hour away from MSU's campus, she also knew that a traditional program wouldn't work. Then she heard about the Strategic Communication Master of Arts at MSU. Because it is an online program, StratCom students are able to take courses from MSU's internationally ranked College of Communication Arts & Sciences wherever they live, on their own schedule. With courses like Digital Media Strategies, Branding & Image, and Strategic Message Development, Van Doorn-Kazyak knew that both the course content and online format of the M.A. would help her achieve her goals. “I looked through the course listing on the website and showed it to my boss and asked, 'Is this real? This is exactly what I want to do.' And my boss said, 'You need to do this right now,'" said Van Doorn-Kazyak. Stephanie met with the StratCom staff to learn more and decided to apply. After starting the program last year, she is already seeing the benefits at work. For a class, Stephanie created a strategic messaging brief related to her job. She liked it so much that she presented it to a supervisor at Herman Miller. It was so well received that parts of it were implemented at the company. "I have learned so much. And people are impressed by the content of the classes when I tell them what I’ve learned,” said Van Doorn-Kazyak. "I would not be where I am right now without this program." Recently promoted to Marketing Specialist of Corporate Social Media, Stephanie says, "I would not be where I am right now without this program." One of the key goals for the program is to connect the latest communication theories with practical applications for working professionals, so these professionals can add more tools to their professional tool box. These tools can be used to earn a promotion, pivot in a career path, or even start from scratch.